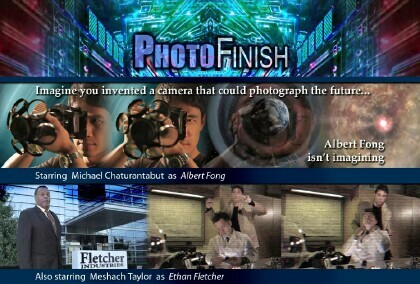 College science teacher Albert Fong was once the top imaging scientist at Fletcher Industries, a technology conglomerate founded by the enigmatic Ethan Fletcher. When Albert is fired from the company, amid unproven (and unfounded) suspicions of selling military secrets to the Chinese government, scientific rival Matt Hayes seizes the opportunity to access Albert’s off-the-grid research regarding his Theory of Preflective Photography. Using Albert’s design, Hayes develops a prototype for the XLR-8, a camera that captures and bends light rays from the future – creating photographs of events that have yet to occur! But Hayes soon realizes that Fletcher has connections to nefarious forces operating within the government – forces that would use the technology not for legitimate security purposes but to topple democracy and enslave the people. Copyright 2018 PHOTO FINISH. All rights reserved.